In recent glass related news, CSR (Viridian Glass) has sold their Alexandria property, which was a glass manufacturing factory dating back to the 1930’s, to Bunnings Warehouse. Bunnings has announced that the site will be transformed into another flagship store, due to open in 2012. Due to the age of the building, no doubt heritage listing will influence any redevelopment plans. In an ironic twist, in recent times Bunnings has become a thorn in the side of Viridian Glass and the glass industry in general by introducing toughened glass panels to it’s range of products. One of the most popular of these new products is 12mm Toughened, which is commonly used in frameless balustrades. The Australian Standard AS1288 underwent an overhaul in 2006, placing many restrictions on the type installations where frameless glass can be used. Selling this type of glass to the general public has been frowned upon by the glass industry because of the possible dangers relating to its use in frameless designs. 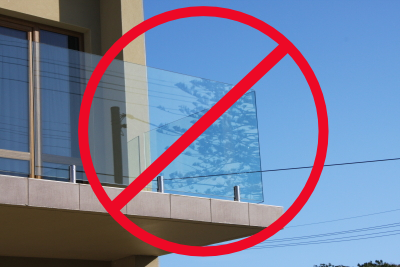 While the glass itself may comply with Australian Standards the installation of this product may not comply, depending on each individual situation.